After being dissatisfied elsewhere, I found the site wonderful and easy to use. The gift I ordered arrived within the time frame provided and is what I expected, although the engraving could have been a little darker. The order status was not updated to reflect anything other than "in process", so that could be improved. This is a super great gift for your groomsmen. Its at the best when you buy it before the wedding and you give it to.them to use for the wedding! 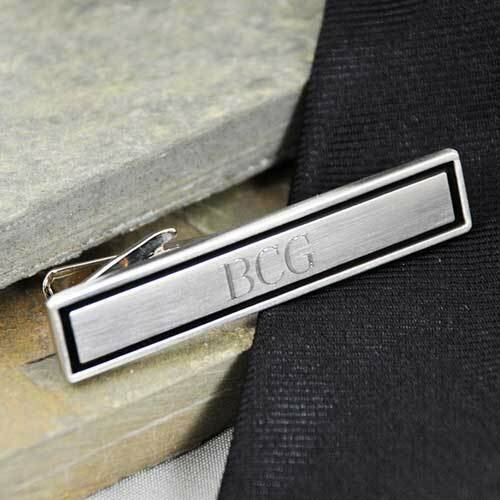 A:This tie clip can only be engraved with up to 3 block initials. There isn't enough room to cleanly engrave a full date on the clip. This personalized black border tie clip is a sophisticated accent fit for the important men in your life. This is the perfect retro-inspired groomsmen's gift. Brushed nickel gives this slim, rectangular clip an understated sheen while a black epoxy trim and personalized three-letter monogram add the finishing touches. A silver gift tin is included. Measures 1.97"L x 0.39"W.